Geriatrics - forum with Physicians! 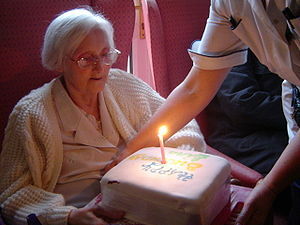 Elderly woman in a residential care home, receiving a birthday cake. Dementia, Arthritis, Palliative care,Osteoporosis, Osteoarthritis, Rheumatoid Arthritis, Parkinson's Disease,Atherosclerosis, Heart Disease, High Blood Pressure, High Cholesterol. Geriatrics or geriatric medicine is a specialty that focuses on health care of elderly people. It aims to promote health bypreventing and treating diseases and disabilities in older adults. There is no set age at which patients may be under the care of ageriatrician or geriatric physician, a physician who specializes in the care of elderly people. Rather, this decision is determined by the individual patient's needs, and the availability of a specialist. Geriatrics, the care of aged people, differs from gerontology which is the study of the aging process itself. The term geriatrics comes from the Greek γέρων geron meaning "old man", and ιατρός iatrosmeaning "healer". However, geriatrics is sometimes called medical gerontology. Internal Medicine/Emergency Medicine/Interventional Pain Management Physician/Medical Informatic Consultant Lee Peter Bee, D.O., F.A.C.O.I. 17 años de experiencia en industria farmacéutica, asuntos regulatorios, marketing. Alejandro Melo-Florián M.D., F.A.C.P.